On Tuesday June 5th, 2012 at 6:30 p.m. The Iowa 80 Trucking Museum hosted its first ever Classic Movie Night. The movie Convoy, was shown in the REO Theatre. Admission to the event was by donation only, and was a success! 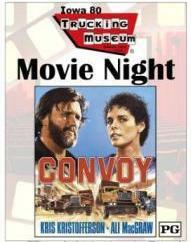 The Iowa 80 Trucking Museum will be announcing dates for upcoming classic Movie Nights that will be held throughout the summer. Check back for future dates or like us facebook for the latest news and events. Thank you to everyone that joins us in Celebrating Trucking History. Movie Information: Citizen Band radio takes to the freeways for fast-lane thrills and fly-over spills. Trucker “Rubber Duck” (Kris Kristofferson) signals the big 10-4 when he and his unsuspecting ride along (Ali MacGraw) are chased through three states by a corrupt traffic cop named “Dirty Lyle” (Ernest Borgnine). The green light is sent out over the American CB airwaves for a convoy of truckers to help keep the police off his trail. Acclaimed and award winning director Sam Peckinpah steps on the gas for an all-action adventure jam-packed with sensational stunts and truck crashes around every turn!